Print pieces and outfits are all the rage becuase they add a lot of personality and character. I believe that the brighter and louder the print, the happier the mood. Capital FM radio presenter, Anita Nderu is a fashionista in her own right, with a petite frame and bubbly personality, the Hits Not Homework show host stuns in her different outfit and pieces. This new style segment on the blog will be showacasing different looks and styles of personalities. For the first look Anita Nderu rocks a bright blue floral print jumpsuit by Kenyan brand, Sewe Kenya. She accessorizes the look simply with a simple black clutch bag, chandalier earrings and a hightop bun. In the second look, Anita Nderu rocks a favorite piece that has also been seen on fashion blogger Nancie Mwai and food blogger Miss Mandi Sarro. This piece is available from Shop New Level and is actually a two piece set that can be worn seperately. We love how she rocked it with a pair of royal blue platform heels and statement earrings. 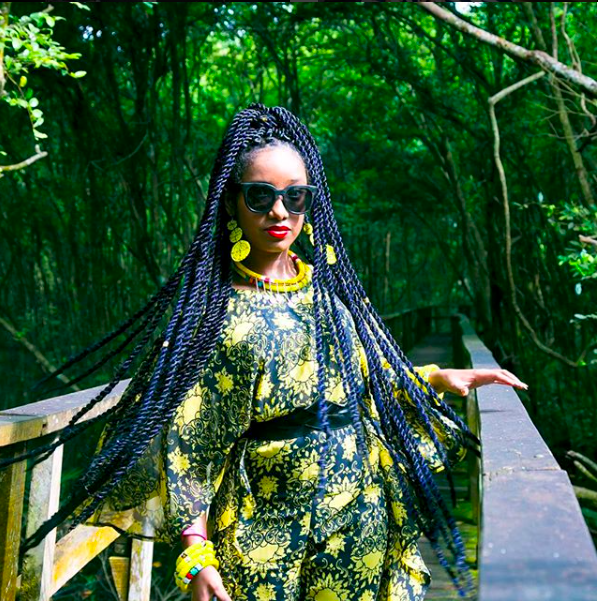 Another favorite look is Anita in this Afrocentric print piece from Nigerian brand , the Muse Factory. We love the hints of purple and pink and we love the geometric print and exaggareted sleeves on her. This look is perfect for a day out and about, or Sunday brunching with a group of friends.